Diagnostic Features - Antennae 11-segmented. Eyes well developed, ocelli present but may be reduced. Mandibles with the apical margin oblique and dentate, overhung by clypeus. Alitrunk constricted in the mesonotal region, the propodeum swollen and bidentate or bituberculate. Petiole a scale with the dorsal margin bispinose, bidentate or emarginate. Acidopore borne on a conical projection of the hypopygium, surrounded by a fringe of hairs. The evidence at present for this area is for the existence of two species-groups - note the early authors mostly used two "species" -"capensis" and "frauenfeldi". The capensis species had a petiole which was bidentate not bispinose. True Lepisiota capensis (from South Africa) is black with sparse erect black hairs. Some of the confusion may stem from Forel (1892a: 43) where his key had - capensis (from South Africa, Madagascar and Indian continent) with "erect pilosity whitish, abundant on body, none on tibiae and scapes". also "petiole scale narrow with two short spines" - This clearly was erroneous in both those aspects. Note - the diagnosis and separation of the carbonaria-group species is somewhat speculative, as the many of original descriptions are minimal separations of "subspecies". The efforts of Collingwood, later with Agosti, are admirable but the papers again give fairly minimal information and their separations also seem to owe more than a little to informed guesswork. 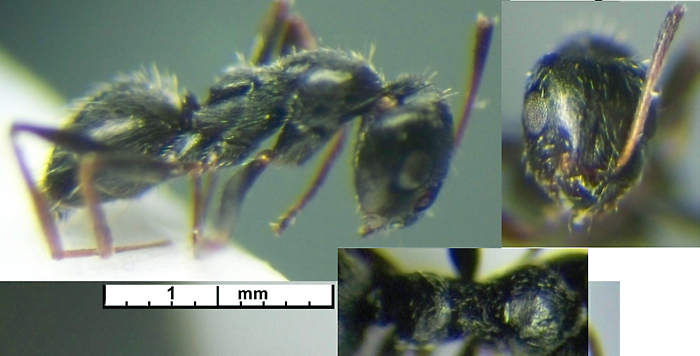 Some species are included for comparison with those now known from Egypt, e.g L. simplex and L. incisa. 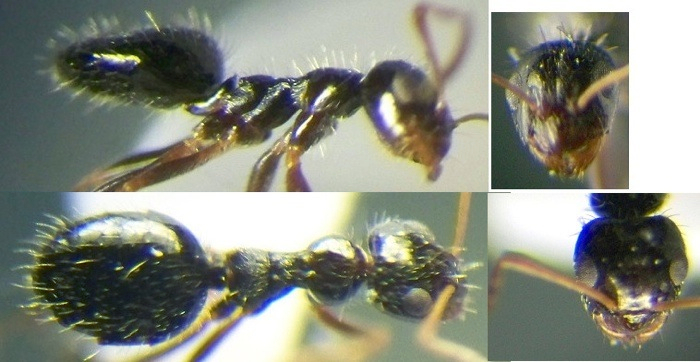 frauenfeldi-group - elongated, shiny species; with long antennae and legs; propodeum and petiole usually with sharp prominences or spines; plus reduced or no pilosity and little pubescence. Egyptian species are shown below. canescens-group - shiny with fine erect pilosity. As yet none reported from Egypt. -- Petiole spines about half as long as their intervening width or less, scale narrow apically in profile; with abundant variably long erect white hairs on all surfaces; distinctive downcurved hairs on clypeus.